Isaac Smith (second from left in boat, in red coat) preparing to step ashore in Botany Bay, April 1770. Isaac Smith (1752–1831) was a Rear Admiral in the Royal Navy and cousin of Captain James Cook, with whom he sailed on two voyages of exploration in the South Pacific. Smith was the first European to set foot in eastern Australia and the first to prepare survey maps of various Pacific islands and coastlines including Tierra del Fuego in South America. Smith was born in London in 1752, the eldest of seven children of Charles and Hannah Smith and cousin to James Cook's wife Elizabeth. He enlisted for naval service in 1767 at the age of thirteen, using his family connections to secure an immediate ranking of able seaman and a position aboard HMS Grenville under Cook's command, for a survey voyage off the west coast of Newfoundland. On 27 May 1768, and still ranked able seaman, he transferred to his second vessel, Cook's Endeavour, at Deptford ahead of its expedition to the Pacific to observe the 1769 Transit of Venus and then to search the south Pacific for signs of the postulated Terra Australis Incognita (or "unknown southern land"). Smith sailed with Cook to Tahiti, then to New Zealand and the east coast of Australia. On 28 April 1770 he became the first European to set foot on eastern Australian soil, Cook telling him "Jump out, Isaac" as the ship's boat touched the shore at Botany Bay. A month later on 23 May 1770, Smith was promoted to midshipman following James Magra's suspension on suspicion of having assaulted Cook's clerk. Cook's lieutenant Zachary Hicks died from tuberculosis in May 1771, and was replaced by the master's mate Charles Clerke. In turn, Smith was promoted to fill Clerke's former role and served with distinction for the remainder of the voyage. Cook singled him out in a letter to the Secretary of the Admiralty in 1772, noting that Smith "had been of great use to me in assisting to make Surveys, Drawings &c in which he is very expert." Smith sailed again with Cook in 1772, as master's mate aboard HMS Resolution. He assisted first mate Joseph Gilbert in drawing Cook's maps and survey charts during the voyage, including one of the first recorded maps of Tierra del Fuego in 1773. Smith's wider artistic talents were also demonstrated by the production of a small watercolour of icebergs, painted while Resolution sailed close to Antarctica in 1773. On Resolution's return Cook again singled Smith out for praise, advising Admiralty that he was "a Young man bred to the Sea under my care and who has been a very great assistant to me in [making charts], both in this and my former voyage." On Resolution's return to England in 1775, Smith was promoted to lieutenant and given command of the elderly 16-gun sloop HMS Weazel, holding this post for two years. In December 1787, he was promoted to post-captain in command of the 36-gun frigate HMS Perseverance. The future Admiral John Surman Carden was a member of Smith's crew from 1787 to 1793, before his transfer to HMS Marlborough. As captain of Perseverance, Smith was assigned to the East Indies Station under the overall command of Admiral William Cornwallis and took part in the capture at sea of the French frigate Résolue in 1791 at the Battle of Tellicherry, shortly before the outbreak of the first French Revolutionary War. Despite this achievement and continued commendation from his superiors, Smith's active service days were drawing to a close. In 1794 he contracted hepatitis, and his ill health gradually prevented him from performing his duties. In either 1804 or 1807 he applied for and received a promotion to the superannuated post of Rear Admiral and returned to England to retire. In initial retirement Smith shared a house in Clapham with his cousin, Cook's widow Elizabeth, until in the 1820s he inherited Merton Abbey in Merton, Surrey, from his brother in law. He then divided his time between these two homes, until his death on 2 July 1831 at the age of 78. His will left a sum of £700 to the church of St Mary the Virgin in Merton, the interest from which was to support the poor of the parish. A memorial to Smith, originally financed by Elizabeth Cook, stands in the church grounds. ^ "Secret Instructions to Lieutenant Cook 30 July 1768 (UK)". National Library of Australia. 2005. Archived from the original on 21 July 2008. Retrieved 26 August 2008. ^ Maclean, Donald (5 August 1933). "Coasting With Cook: A Cruise in Historic Waters". The Argus. Argus Office, Melbourne Victoria. p. 9. Retrieved 20 July 2009. ^ "Maritime Memorials". National Maritime Museum (UK). 2009. Retrieved 20 July 2009. ^ Lewis (ed. ), Samuel (1848). A Topographical Dictionary of England: Mersea, East – Methwold. Institute of Historical Research. pp. 295–298. CS1 maint: Extra text: authors list (link) cited in "British History Online". University of London & History of Parliament Trust. 2009. Retrieved 19 July 2009. ^ "St. Mary the Virgin". Merton Council (UK). December 2006. Retrieved 20 July 2009. Besant, Walter (2009). Captain Cook. BiblioLife. ISBN 978-1-103-06135-8. J.C. Beaglehole, ed. (1968). The Journals of Captain James Cook on His Voyages of Discovery, vol. I:The Voyage of the Endeavour 1768-1771. Cambridge University Press. Blainey, Geoffrey (2008). Sea of Dangers. Penguin Group (Australia). ISBN 978-0-670-07223-1. Hough, Richard (1994). Captain James Cook. Hodder and Stoughton. ISBN 978-0-340-82556-3. Rigby, Nigel; van der Merwe, Pieter (2002). Captain Cook in the Pacific. National Maritime Museum (UK). ISBN 0-948065-43-5. Robson, John (2009). Captain Cook's War and Peace: The Royal Navy Years 1755-1768. University of New South Wales Press. p. 23. ISBN 9781742231099. Urban, Sylvanus (1831). "Obituary". The Gentleman's Magazine. Parliament Street, London: J. B. Nichols & Son. 51 (24). Retrieved 20 July 2009. Captain James Cook was a British explorer, navigator, cartographer, and captain in the Royal Navy. He made detailed maps of Newfoundland prior to making three voyages to the Pacific Ocean, during which he achieved the first recorded European contact with the eastern coastline of Australia and the Hawaiian Islands, and the first recorded circumnavigation of New Zealand. HMS Endeavour, also known as HM Bark Endeavour, was a British Royal Navy research vessel that Lieutenant James Cook commanded to Australia and New Zealand on his first voyage of discovery from 1768 to 1771. HMS Resolution was a sloop of the Royal Navy, a converted merchant collier purchased by the Navy and adapted, in which Captain James Cook made his second and third voyages of exploration in the Pacific. She impressed him enough that he called her "the ship of my choice", and "the fittest for service of any I have seen." HMS Rose was a 20-gun (Seaford-class) sixth-rate post ship of the Royal Navy, built in Hull, England in 1757. Her activities in suppressing smuggling in the colony of Rhode Island provoked the formation of what became the Continental Navy, precursor of the modern United States Navy. She was based at the North American station in the West Indies and then used in the American Revolutionary War. She was scuttled in the harbor of Savannah, Georgia in 1779. A replica was built in 1970, then modified to match HMS Surprise, and used in two films, Master and Commander: Far Side of the World and Pirates of the Caribbean: On Stranger Tides. Captain Charles Clerke was an officer in the Royal Navy who sailed on four voyages of exploration, 3 with Captain James Cook. When Cook was killed during his 3rd expedition to the Pacific, Clerke took command but died later in the voyage from tuberculosis. 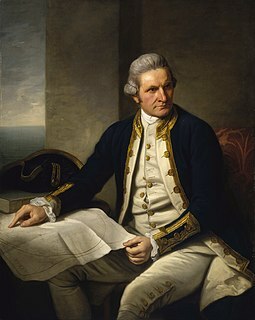 The first voyage of James Cook was a combined Royal Navy and Royal Society expedition to the south Pacific Ocean aboard HMS Endeavour, from 1768 to 1771. It was the first of three Pacific voyages of which Cook was the commander. The aims of this first expedition were to observe the 1769 transit of Venus across the Sun, and to seek evidence of the postulated Terra Australis Incognita or "unknown southern land". Captain John Gore was a British American sailor who circumnavigated the globe four times with the Royal Navy in the 18th century and accompanied Captain James Cook in his discoveries in the Pacific Ocean. Admiral of the Fleet John Forbes, styled The Honourable from 1734, was a Royal Navy officer. After taking part in an expedition to Lisbon to support the Portuguese in the face of a Spanish threat, he saw action as captain of the third-rate HMS Norfolk at the Battle of Toulon during the War of the Austrian Succession. He was one of the few captains who really bore down on the enemy. The second voyage of James Cook, from 1772 to 1775, commissioned by the British government with advice from the Royal Society, was designed to circumnavigate the globe as far south as possible to finally determine whether there was any great southern landmass, or Terra Australis. On his first voyage, Cook had demonstrated by circumnavigating New Zealand that it was not attached to a larger landmass to the south, and he charted almost the entire eastern coastline of Australia, yet Terra Australis was believed to lie further south. Alexander Dalrymple and others of the Royal Society still believed that this massive southern continent should exist. After a delay brought about by the botanist Joseph Banks' unreasonable demands, the ships Resolution and Adventure were fitted for the voyage and set sail for the Antarctic in July 1772. James Cook's third and final voyage took the route from Plymouth via Cape Town and Tenerife to New Zealand and the Hawaiian Islands, and along the North American coast to the Bering Strait. Captain James Cook, FRS, RN was a British explorer, navigator, cartographer, and captain in the Royal Navy. Cook made detailed maps of Newfoundland prior to making three voyages to the Pacific Ocean, during which he achieved the first recorded European discovery of eastern Australia, Hawaii and undertook the first circumnavigation of New Zealand. The complement of HMS Bounty, the Royal Navy ship on which a historic mutiny occurred in the south Pacific on 28 April 1789, comprised 46 men on its departure from England in December 1787 and 44 at the time of the mutiny, including her commander Lieutenant William Bligh. All but two of those aboard were Royal Navy personnel; the exceptions were two civilian botanists engaged to supervise the breadfruit plants Bounty was tasked to take from Tahiti to the West Indies. Of the 44 aboard at the time of the mutiny, 19 were set adrift in the ship's launch, while 25, a mixture of mutineers and detainees, remained on board under Fletcher Christian. Bligh led his loyalists 3,500 nautical miles to safety in the open boat, and ultimately back to England. The mutineers divided—most settled on Tahiti, where they were captured by HMS Pandora in 1791 and returned to England for trial, while Christian and eight others evaded discovery on Pitcairn Island.